Mom For A Deal: Save Up To 90% Off Retail with Totsy! 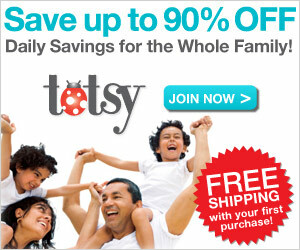 Save Up To 90% Off Retail with Totsy! Totsy is the first company in private sales to take on sustainable and socially responsible initiatives in all areas of business. One baby, one tree: With every purchase you make through Totsy, they will plant one tree in the name of your child to help reduce the effects of deforestation. Who says shopping can’t save the world? Sign up HERE!